Several health-related study committees met during the summer and fall months, and most of them are wrapping up their work. The Consumer and Provider Protection Act Study Committee held its final open meeting in November with a focus on network adequacy and provider directories. 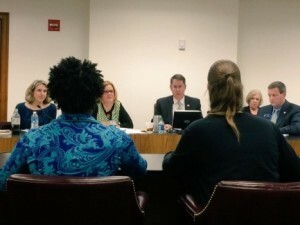 Claire McAndrew from Families USA, a national consumer health advocacy organization, and Georgians for a Healthy Future’s Health Policy Analyst Meredith Gonsahn delivered testimony on the importance of setting network adequacy standards and ensuring provider directory accuracy and usability. Look out for a final report from the committee in December! Read Meredith’s testimony here. Read Claire’s testimony here. Network Adequacy: We Have a Model Act! Last week, GHF was on the road again traveling to Athens for UGA’s annual State of Public Health conference. The SOPH conference is a chance for public health researchers, practitioners, and students to share and learn about the newest public health initiatives and research happening across Georgia. We were excited to be featured as a presenter among other experts, advocates, and leaders in Georgia’s public health domain. In a workshop dedicated to the Affordable Care Act, GHF teamed up with Georgia Watch to talk about Marketplace enrollment efforts in Georgia. The presentation was based on GHF’s “Getting Georgia Covered” report, which explored the successes and barriers to outreach and enrollment efforts in Open Enrollment 2. We also previewed the upcoming open enrollment period, which starts on Sunday, Nov. 1, 2015, and advocated for closing Georgia’s coverage gap. The other presenters in the workshop, including another presentation from our partner Georgia Watch, comprehensively covered the new ACA requirement for hospitals to complete a community health needs assessment (CHNA) of their service area every 2-3 years and how that is being implemented in Georgia. The workshop generated some excellent questions and constructive conversation about these two very different aspects of the ACA. The nation’s uninsured rate has plummeted over the past year and a half. Here in Georgia, more than 400,000 people have enrolled in health insurance, bringing our state’s uninsured rate down to 15 percent. While there is still much work to be done to ensure that all Georgians have a pathway to coverage (like expanding Medicaid), it’s also important to make sure that those who are newly covered are able to access needed health care services. Are newly insured Georgians accessing the care they need? For the most part, the answer seems to be yes. The early evidence shows that most people who signed up for health insurance have been able to find a doctor with relative ease and get an appointment for primary care within a week or two. This is a development worth celebrating, but there are also some warning signs on the horizon that policymakers should heed: according to a recent study by the University of Pennsylvania, Georgia had the highest percentage of health plans utilizing “narrow networks” of providers. In addition, reports of provider directory inaccuracies and networks too skinny to deliver all of the services in a plan’s benefit package have started to emerge. Narrow networks offer a limited choice of providers in exchange for a lower premium. While many Georgians are willing to make this trade-off, others need a broader network to meet their health needs. And everyone deserves the tools and information to make that choice and to know that they can access services for all covered benefits. Health care consumers now have access to standardized information about premiums, benefits, deductibles, and other health plan features that make it easier to pick the right plan. Yet provider network size and composition remain a black box for consumers, holding them back from making the best, most informed decision they can. Combined with a rapid trend toward narrow networks, this could put some consumers at risk of not being able to access all of the providers and services they need (or at risk for high medical bills if they have to go out-of-network). At Georgians for a Healthy Future, we pride ourselves on strong partnerships. Over the past few years, we have been collaborating with Georgia Equality and the Health Initiative to ensure that the health care needs of LGBT Georgians are not neglected. 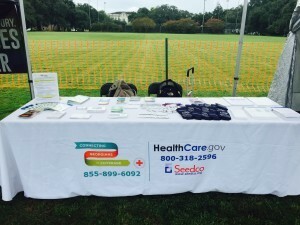 These partnerships brought Whitney Griggs, GHF’s Consumer Education Specialist, to Savannah on September 12th for the annual Savannah Pride Festival. Together with the Health Initiative, Whitney distributed information related to LGBT health care needs and spoke to festival attendees about how to enroll in health insurance. Of particular interest was our joint fact sheet with Georgia Equality on Transgender Health Care. Some of the festival attendees who picked up this fact sheet shared stories of having been denied coverage due to being trans-identified in the past, but who can now get coverage that meets their needs because of the Affordable Care Act. People that stopped by the table were also interested to learn that health care services must be provided regardless of gender identity or expression. This means that health insurance plans must cover transition-related care, as long as that care is covered for cisgendered people under on the same plan. So services such as hormone replacement therapy and gender-specific care (like mammograms and prostate exams) must be covered if they are covered for other people enrolled in the same plan. During the 2015 Legislative Session, the State Senate established the Consumer and Provider Protection Act Study Committee. This committee will review and make recommendations around several health insurance practices, including network adequacy. GHF has identified network adequacy, or the sufficiency of the health care providers patients can access when they enroll in a health insurance plan, as an important emerging consumer health issue. Our Executive Director, Cindy Zeldin, is a member of the study committee and looks forward to bringing the consumer perspective to the committee’s work. 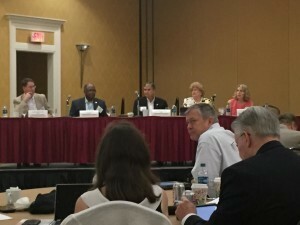 Cindy also recently appeared on WABE and Top Docs Radio to talk about network adequacy and participated in a panel discussion along with several state legislators at the Medical Association of Georgia’s Summer Legislative Education Seminar to discuss this important issue. Stay tuned for study committee agendas, updates, and opportunities to weigh in! GHF conducted in-depth interviews with and survey of enrollment assisters across the state to identify best practices and lessons learned from open enrollment 2. Here’s a summary of what worked, what didn’t, and what we can improve on next year. Using a variety of local venues to conduct extensive outreach. Across the board, enrollment assisters identified the importance of conducting a broad range of outreach and enrollment activities at the local level. They identified a variety of venues where they successfully reached consumers including libraries, churches, college campuses, Volunteer Income Tax Assistance (VITA) sites, doctor’s offices, community health centers, cooperative extension offices, small businesses, AIDS service organizations, and local hospitals. For example, one navigator organization worked with a nurse navigator who met with uninsured consumers who presented at the emergency room at the local hospital. The nurse navigator connected these uninsured consumers to a navigator organization, allowing the organization to reach a much larger pool of consumers than if they had not had this partnership. Enroll America also provided significant support to assisters’ outreach and enrollment efforts. Assisters were limited in their ability to retain personal information about consumers, but because Enroll America only provided outreach and education, they could retain contact information and follow up with consumers seeking more information about the Marketplace. In a 6-3 ruling the Supreme Court upheld tax credits in the Affordable Care Act. This is a big victory for Georgia health care consumers! As an organization committed to making sure all Georgians have access to the health care they need, Georgians for a Healthy Future is celebrating today’s Supreme Court decision! This ruling is a big win and a big relief for the more than 400,000 newly enrolled Georgians who can keep their coverage and the access to care and financial peace of mind that comes with it. Now that the outcome of King v. Burwell is clear, we must not forget these workers, parents, and veterans in our state who still lack access to quality, affordable health insurance. It’s time to close the coverage gap. Tell your legislator that it’s time to close the coverage gap!